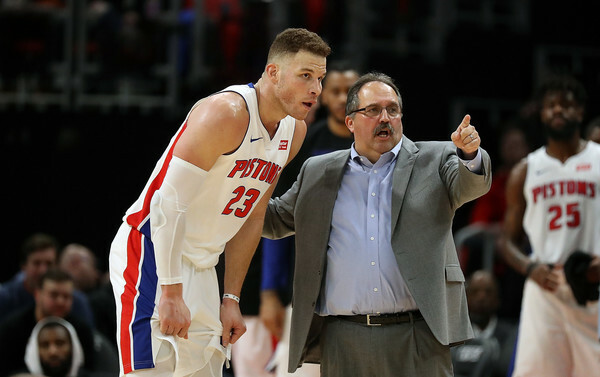 On Friday night at Little Caesars Arena against the Boston Celtics, Blake Griffin engaged in a play that served as a microcosm of the Pistons’ existence for the past decade. Griffin, the Pistons’ so-called superstar acquired a month ago from the Los Angeles Clippers, made a move along the base line and found himself in a position to slam home a reverse dunk. But the attempt barely hit the front of the rim, and Griffin tumbled to the floor as the crowd groaned. The episode quickly became a darling on Twitter, which is cruelly ironic because the Pistons have been irrelevant since the Bush administration. The rim’s rejection of Griffin’s dunk attempt speaks volumes, in so many ways. First, it showed that the Blake Griffin of 2018 can’t get in the air like he once did. Second, it represented the Pistons’ futile attempts since their last Eastern Conference Finals appearance in 2008 to play with the big boys in the NBA. And third, it proved to be, in just a few seconds’ worth of court time, the end of the Griffin honeymoon in Detroit and the commencement of the long, slow consumption of a contract that the Pistons are going to gag on well before it expires. Pistons President and coach Stan Van Gundy is in his fourth season in Motown since taking over the reins, wearing his dual hats of executive and chalk talker. And it’s fair to say that the team—and, by extension, the entire franchise—is no better off now than it was on that day in May 2014 when Pistons owner Tom Gores unveiled a business model that hardly any teams in the league mirror. We’re seeing why it’s not popular. And it’s certainly no laughing matter, what’s going on with the Pistons these days. The blockbuster trade that sent Tobias Harris and Avery Bradley to the Clippers and brought Griffin and his albatross of a contract to the Pistons played well in Detroit for about a week. Since then, the fans—and, I hope, the media—are beginning to catch on. The Pistons—well, Van Gundy, specifically—got taken. The Clippers went in search of a fool that would take Griffin and his contract off their hands and they found one. P.T. Barnum is erroneously credited with saying, “There’s a sucker born every minute,” though the phrase did exist in this country’s lexicon as far back as the late-19th century. Barnum, the legendary entertainer and co-founder of the Barnum and Bailey Circus, was a showman who enjoyed exploiting patrons’ tendency to buy into the sensationalized and the bizarre. The circus doesn’t come to town anymore in Detroit, but there’s a big top inside LCA and a clown (SVG) who performs under it. Griffin has been with the Pistons for about a month and after a few games and a few wins, he and the team have nosedived back into mediocrity. The Pistons are no better with Griffin and his 39 percent shooting and fetish for turning the ball over than they were before the trade. Just like they’re no better off now than when SVG took over. But that’s not even the punchline. The best part is that not only are the Pistons spinning their wheels, they have little to no maneuverability thanks to the money sunk into Griffin and center Andre Drummond. Dried army rations and the canned goods you have in your pantry will expire before the deals that the Pistons are committed to with Griffin and Drummond. SVG has not only not improved the Pistons in four years, he’s made their future arguably worse than it was when he arrived. And the Pistons were pretty bad when he got to town. Van Gundy has said that he was surprised that Griffin was made available by the Clippers, who inked the power forward to a five-year, $173 million pact last summer, preventing him from hitting the open market as an unrestricted free agent. But after watching Griffin, who’s been injury plagued for several seasons in a row, labor through his first month with the Pistons, it’s not really surprising at all that the Clippers were eager to make a trade. The Clippers wanted to get something for Griffin after he opted out of his old contract in order to become a UFA. So they signed him amid pomp and circumstance (they put on an elaborate show that included the raising of Griffin’s no. 32 to the rafters, simulating the Clippers retiring his jersey—something that Barnum would be proud of), and then settled back to bide their time so they could flip him for a cheaper contract and a first round draft pick. Which they did, thanks to the suckers in Detroit. Didn’t the Pistons scout Griffin as soon as they found out that the Clippers were ready to dangle him as trade bait? His numbers with the Clippers this season didn’t look that bad (22.6 ppg; 44.1 FG pct. ; 7.9 rpg; 5.4 apg), but he clearly doesn’t possess the same skills that made him an NBA monster and five-time All-Star, a distinction that he is now three years beyond. Griffin has played nine games for the Pistons and while the team is 5-4 overall, they’ve lost four of their past five and Griffin seems to look worse in each one. But this isn’t just about the Griffin trade, which will hamstring the Pistons for several years. Van Gundy has no vision as an executive. He has no concept of what it means to always be thinking two, three moves ahead, as the master chess players in the league’s front offices do (case in point: Boston’s Danny Ainge). Van Gundy doesn’t value draft picks and his moves, when you look back on them, are cringe-worthy, especially when you consider how fat the teams who Van Gundy has dealt with, get after they collaborate with the Pistons. Van Gundy the coach isn’t all that anymore, either. His routine bemoaning of how his team isn’t hungry and doesn’t play defense has become, well, routine, and is a clear indictment on him as a coach. Sure, the Griffin jerseys flew off the shelves at all the sports apparel shops across Metro Detroit in the 24-48 hours after the trade was announced. And the Pistons going 4-0 immediately after the trade didn’t hurt. But the curtain has been peeled back now and we see that the Great and Powerful Oz behind the scenes at LCA isn’t really who he purports to be. Stan Van Gundy has been doing this executive apprenticeship for four years and he hasn’t learned a thing. Other teams are passing the Pistons by in terms of player development and setting themselves up for the future, as if SVG’s team is standing still. Oh, I lied. There really is another punchline here. As bad as the Griffin trade is already proving to be, it likely bought SVG more time in Detroit. Owner Gores got starstruck, signed off on the Griffin deal, and now he’s going to give Van Gundy a few years to build a roster around Griffin and Drummond, the Pistons’ Bobbsey Twins. So for those clamoring for SVG to get the ziggy, don’t hold your breath. The Griffin trade is merely the most financially expensive mistake Van Gundy had made as Pistons President. It’s far from the only one. His stint in Detroit thus far has been an unmitigated disaster. The Pistons are almost certain to miss the playoffs for the third time in Stan’s four years here. The Pistons haven’t won a playoff game in 10 years and yet have not had a top-five draft pick in that time frame, either. That’s an almost unbelievably stunning feat of league irrelevance to pull off. How does that even happen? The die hard pro basketball fans in Detroit may be few and far between, but those that exist aren’t easily duped. They’re catching on to this Griffin nonsense. They aren’t fools. If only we could say the same about the man with the key to the executive washroom.